The wind howls this morning, even worse than yesterday. 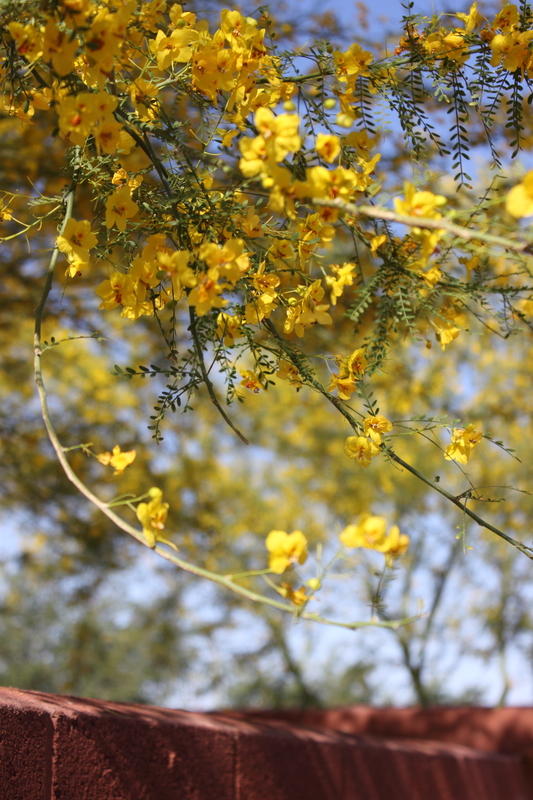 It strips the blossoms from the Palo Verde trees and they pile up like yellow snow-banks against the curbs. It does its job, tells us it’s there by knocking things around out in the yard. It puts everyone in an unsettled mood, even the animals. I thought maybe I would skip prayer, but then how could I do that? Prayer is talking to God and wasn’t I just doing that when I thanked Him for another day off? When I thanked Him for the last two? More than a set time each day, it’s become part of the fabric of my being, because somewhere along the line I realized there is not ever a moment when I don’t need Him. That might sound weak, but only if you don’t realize how big He is. ………..only if you are under the false assumption that you can do this life successfully without Him. I let that delusion go awhile back. And I realized that was the beginning of what God calls wisdom. 1 Thessalonians 5:16: “Be joyful always; pray continually; give thanks in all circumstances; for this is God’s will for you in Christ Jesus. This is God’s will for you in Christ Jesus…….all those times I asked that very question and it was right here all the time, the anchor verse that rests on everything else. Dorothy had the power to go home all along, she just forgot the power those red shoes had, kind of like what we do as Christians when we forget that His home is within us. It’s simple math. Kind of like the person who searches here and there for just the right diet, the secret to losing weight, the magic formula. Here it is, are you ready? Eat less than you burn up. Eat the foods God created you for. Get up and move, because our bodies were made for that, not for sitting in office chairs 12 hours a day. Pray always. God wants to hear from you in the little everyday moments. That fact alone is what keeps me in a state of wonder every time I think of it. That the King of everything wants……..me. This entry was posted in Uncategorized and tagged Christian living, Everyday Faith, Holy Spirit, Prayer, Reflection. Bookmark the permalink.